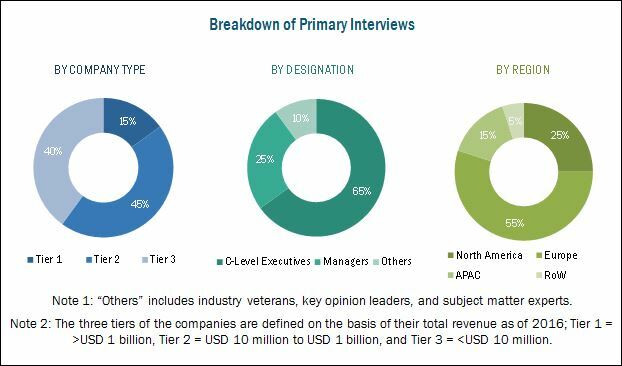 [147 Pages Report] The adaptive optics market was valued at USD 218.8 Million in 2016 and is expected to reach USD 2,190.9 Million by 2023, growing at a CAGR of 40.8% from 2017 to 2023. The base year used for this study is 2016 and the forecast period is from 2017 to 2023. To benchmark players within the market using proprietary Competitive Leadership Mapping, which analyzes market players on various parameters within the broad categories of business and product strategy. To estimate the size of the adaptive optics market, top-down and bottom-up approaches have been followed in the study. This entire research methodology includes the study of annual and financial reports of top players, presentations, press releases; journals such as “Short-wave infrared adaptive optics and applications” by Xenics nv (Belgium), “Adaptive Optics” by Indian Institute of Astrophysics (India); paid databases such as Google Finance, Factiva (By Dow Jones & Company), and Yahoo Finance; and interviews with industry experts. Also, the average revenue generated by the companies according to the region was used to arrive at the overall adaptive optics market size. This overall market size was used in the top-down procedure to estimate the sizes of other individual markets via percentage splits from secondary and primary research. The adaptive optics ecosystem comprises equipment manufacturers such as Teledyne e2v (UK) LTD (UK), NORTHROP GRUMMAN CORPORATION (US), Thorlabs, Inc. (US), Iris AO, Inc. (US), Adaptica S.r.l. (Italy), Active Optical Systems, LLC (US), Flexible Optical B.V. (Netherlands), Imagine Optic SA (France), Boston Micromachines Corporation (US), and Phasics Corp. (France). The adaptive optics market is expected grow from USD 218.8 Million in 2016 to USD 2,190.9 Million by 2023, at a CAGR of 40.8% from 2017 to 2023. The major drivers for the growth of this market are the adoption of adaptive optics in ophthalmology and retinal imaging as well as increased government funding. 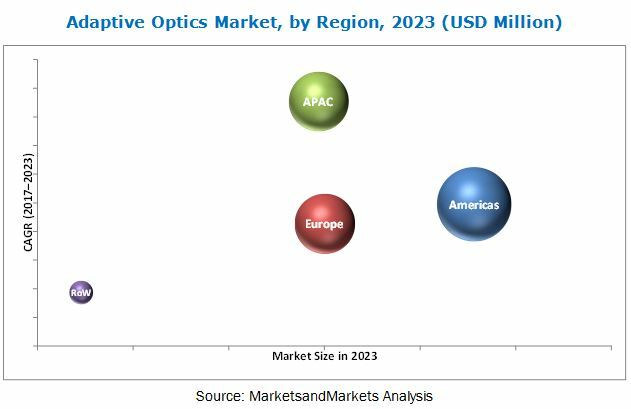 Moreover, advancing adaptive optics technology and need for corrective eyewear is further propelling its market growth. In the component segment, wavefront sensors hold the largest share of the adaptive optics market. Moreover, the market for wavefront sensors is expected to grow at the highest rate in the adaptive optics market from 2017 to 2023. These sensors are used in various adaptive optics applications; for instance, wavefront sensors are used for many laser applications such as laser beam diagnostic and laser material processing for controlling laser beam shape and size to increase accuracy. The wavefront measurement is also required in many optical applications to characterize the profile of optical components or to estimate the aberrations to which the input wavefront has been subjected. Similarly, wavefront sensing can be used in metrology and microscopy. Among the various end-user industries covered in this report, military and defense held the largest market share, followed by the biomedical industry. Adaptive optics in military and defense is used for the development of state-of-the art defense weapons and highly sophisticated guidance systems. These are also used as a method for improving the effectiveness of direct energy weapons. Also, there is a growing demand for finding ways to apply adaptive optics in horizontal path surveillance systems in the military industry. However, with the development of LCoS-SLM and MEMS deformable mirrors, the consumer industry is likely to exhibit the highest growth in the forecast period. Of all the regions, Americas held the largest market share in terms of revenue in 2016. This market share is mainly attributed to the technological innovations and advancements that led to the innovation of new products. The increasing demands from the biomedical and astronomical applications have led to the growth of adaptive optics in Americas. However, APAC is expected to grow at the highest CAGR from 2017 to 2023. The market in APAC comprises developing economies such as China and India, which have a significant potential for adaptive optics applications. The key restraining factors for this market are the complex designing techniques and high initial cost. Teledyne e2v (UK) LTD (UK), NORTHROP GRUMMAN CORPORATION (US), Thorlabs, Inc. (US), Imagine Optic SA (France), and Boston Micromachines Corporation (US), were some of the leading players in the adaptive optics market as of 2016. These companies primarily focus on organic strategies for market expansion through product launches and in-house development. Some of the key players who follow these growth strategies are Thorlabs, Inc. (US), Teledyne e2v (UK) Ltd., and Flexible Optical B.V. (Netherlands). For instance, in November 2016, Thorlabs launched EXULUS-HD1, a reflective two-dimensional spatial light modulator (SLM) based on liquid crystal on silicon (LCoS) technology. This device provides high-speed phase modulation and high resolution and is suitable for applications such as optical trapping, beam steering and shaping, holography, and adaptive optics. Companies that are profiled in this report are Teledyne e2v (UK) LTD (UK), NORTHROP GRUMMAN CORPORATION (US), Thorlabs, Inc. (US), Iris AO, Inc. (US), Adaptica S.r.l. (Italy), Active Optical Systems, LLC (US), Flexible Optical B.V. (Netherlands), Imagine Optic SA (France), Boston Micromachines Corporation (US), and Phasics Corp. (France). *Details on Business Overview, Strength of Product Portfolio, Business Strategy Excellence, Recent Developments, MnM View, and Key Relationships Might Not Be Captured in Case of Unlisted Companies.